"I never wanted to get into this rat race, but now that I'm in it, I think I'd be an idiot not to play it the way everybody else plays it." Two major concerns in the early 1950s were conformity and the continuing reintegration of the soldiers of World War II into society. These concerns were most notably captured on film in this prestige production from Fox, written and directed by Nunnallly Johnson. 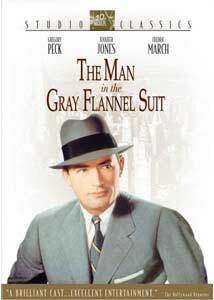 Based on the best-selling novel by Sloan Wilson, the film still holds up well thanks to riveting portrayals, especially by stars Gregory Peck and Fredric March. Tom Rath (Peck) is struggling to get by, working for a nonprofit foundation. Prodded by his wife Betsy (Jennifer Jones), Peck applies for and gets a position doing public relations for the United Broadcasting Corporation. But his real job is to brainstorm a speech for his boss, Ralph Hopkins (March) on a national initiative on mental health. Surrounded by yes-men, Rath must struggle with his conscience and his need for money. Simulataneously, he is plagued by memories of his experiences during the war, including a secret infidelity with young Maria Montagne (Marisa Pavan). At the same time, Hopkins is dealing with problems with his estranged wife (Ann Harding) and daughter (Gigi Perreau). Since this was a prestige project for Fox and producer Darryl F. Zanuck, the picture has something of a bloated quality; a bit of judicious trimming probably would have helped somewhat in keeping the various stories from feeling like separate movies. This is particularly an issue with the extended wartime flashbacks, which go on so long that the return to 1956 is almost always jarring. They do, however, provide plenty of background for Rath so they certainly are necessary. Hopkins' tale similarly takes off on its own, making the viewer feel like we've lost track of Rath and his issues; again, there's a necessary contrast that sets up Rath's decision-making, but it's handled a bit roughly. Mrs. Hopkins in particular gets some long-winded blatant exposition that's quite obnoxious; one can almost see March cringing as he has to listen to the expository speeches that really don't go anywhere. That's doubly true since March himself reiterates the same information later on to Tom. The film's momentum isn't helped any by the inclusion of far too many subplots from the novel. Notwithstanding these structural issues, however, this is still a powerful examination of ethics in business and the choices inherent in a drive for success, which today at least are wider than just the Madison Avenue setting of the story. The problem of yes-men and groupthink (though not identified as such until some years later) would help bring us such problems as the Vietnam War and the invasion of Iraq, emphasizing the timeless nature of the film. Peck is perfect casting for Tom Rath, with an earnestness that just barely hides a tormented soul; that torment is not just because of his ethical problems at work and financial issues, but since he's also been hiding a desperate secret from his wife. Jones has a rather thankless role, as Johnson has made Betsy something of a Lady Macbeth determined to have advancement and property at nearly any cost (though she does stop short of suggesting murder). She's quite the harridan and a bit overwrought at times, making one wonder whether Tom really wishes he had stayed with Maria (though this thought is never quite explicitly raised). March is excellent as well, particularly opposite Peck. The thematic issues of the returning veterans was one previously examined in The Best Years of Our Lives (1946), which had earned March a Best Actor Oscar; his presence here is a rather obvious tie to that earlier classic of the postwar. The supporting cast is quite good too, with Arthur O'Connell as one of the executives at the network, Lee J. Cobb as a less-than-ethical judge supervising a will contest that threatens to take away the Raths' home, and the wry Henry Daniell as the acerbic assistant Bill Ogden who is determined to throw obstacles in Tom's career path. De Forest Kelley even makes a brief uncredited appearance as a combat medic, prophetically saying, "Captain, this man is dead." While Johnson's script has some shortcomings, he has a definite knack for the Cinemascope format. He makes excellent use of the very wide screen, emphasizing Tom and Maria lying down, or at the other spectrum, putting Tom and Betsy at opposite ends of the frame as their relationship deteriorates. Bernard Herrmann contributes an excellent score that is somewhat spare most of the time but has moments that are very big indeed, anticipating his work for Hitchcock in the late 1950s; many segments now have unmistakeable associations with Vertigo and North by Northwest that provide an unintended shiver. The slaps at television, which turns the Rath children into virtual zombies, are quite entertaining and still timely today. Despite some issues with the screenplay, the film is still quite powerful and the performances drive it quite well. Image Transfer Review: The Cinemascope picture looks terrific, with a beautiful appearance and damage unsurprisingly visible only in the stock war footage. The color is faithful to the drab scheme of the original, with a few splashes of color (such as O'Connell's red vest) being startling in their vividness. Shadow detail is a bit lacking, with the blacks being rather intense. Audio Transfer Review: The 4.0 English track (described as Dolby Surround on the case, but presented as four discrete channels) sounds quite nice, with Herrmann's music in particular coming across well. The audio is quite clean, and the war sequences have vivid bass. Directionality is often pronounced, mimicking the original theatrical presentation. The track sounds particularly good in comparison to the Spanish dub, which is full of hiss and quite tinny sounding. Extras Review: Due to the length of the feature, the extras aren't larded on quite as liberally as one is used to from the Studio Classics series, but they're still fairly plentiful. The principal feature is a somewhat disappointing commentary from author James Monaco. He tends to leave long gaps of silence in between comments and seems unprepared (he mentions that he should look up Marisa Pavan's real name but never gets back to it). There are some astute comments, such as the observation that although from the dialogue the film is clearly set in 1956, the set and production design is very much placed in 1953 (the date of the novel). Perhaps editing in remarks from an authority on Herrmann, for example, could have filled the track a little better. For the most part he does avoid the cardinal sin of narrating the film, and he does provide some interesting contrasts to the handling of the story in the novel. A brief segment of a Movietone newsreel from the premiere gives plenty of sightings of the stars. There's an anamorphic widescreen trailer for the feature and trailers for four other films in the Studio Classics series. Finally, there is a gallery of 14 stills and a poster, plus a brief restoration comparison. Despite its roots in the 1950s, this film still speaks quite strongly about the ethical problems one faces in getting ahead in business even today. The transfer is excellent and the extras are worthwhile, par for the Studio Classics line.